Mort Kunstler Handsigned and Numbered Limited Edition Giclee on Paper:"The Bloody Angle"
Edition: Paper Signed Artist's Proof, Limited Edition to 75. COA included. 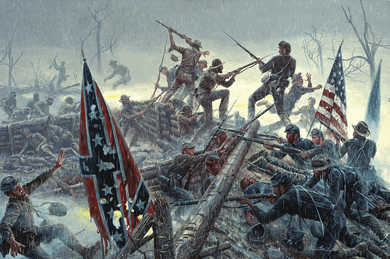 About the Art: The eighteen hours of combat at the Bloody Angle at the Spotsylvania Court House, Virginia, ranks among the legendary actions of the Civil War. I chose to paint this scene even though I had been warned that it would be nearly impossible. I knew the confusion of hand-to-hand fighting, the closeness of the lines, and the harshness of the elements - rain, mud and fog - would make this scene complex. I felt the painting would be successful if I could depict the frenzied fighting at Bloody Angle and the two battle lines formed on either side of the earthworks. Grant's march on Richmond had been delayed. To continue farther into Virginia, his army had to break through the Confederate defenses around Spotsylvania Court House, the strongest and most elaborate system of trenches and earthworks seen in the war to that date. Five and a half feet of earth was piled in front of the Confederate trenches, which were divided into pens about twelve to eighteen feet wide to prevent enfilading fire if the Federals broke the line. The fighting that occurred was horrific. One Federal soldier said, "It was the most terrible day I ever lived." The worst fighting took place in an angle in the log-and-earthen wall. Called the Bloody Angle, this two-hundred-foot section was littered with bodies, sometimes two or three deep. Wounded men suffocated in the mud and drowned in the flooded trenches. Firing occasionally ceased for men to clear the corpses from the trenches so the riflemen would have better footing. Large oak trees were cut down by the continuous fire, frequently crashing down on the ranks in the trenches. The mud and blood mixed to turn the trenches into sticky, horrible graves. In the painting, Union Col. Oliver Edward's brigade, identified by the white crosses on their caps, smashes into Confederate Gen. Robert Rode's Virginians at the west angle. Union soldiers try to top the fallen log while Confederates fire from behind it. The muddy floor of the trench is piled with bodies. Fog obscures the landscape in the background, and the light is diffused. With only a few feet of earthworks separating them, the soldier's acts of desperation became commonplace. In a painting of this type, I feel successful if the desperation and horror these valiant men felt comes across to the viewer. I can think of no more desperate moment for either Northerner or Southerner than the kill-or-be-killed muddy melée at the Bloody Angle.